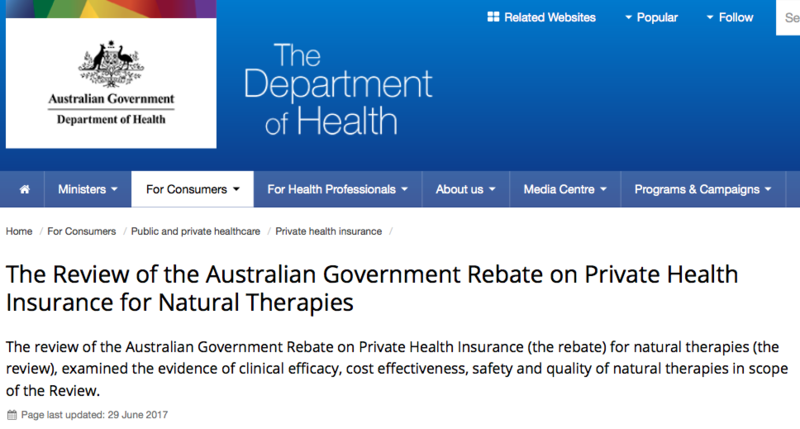 On 16 November 2015, the Department of Health published The Review of the Australian Government Rebate on Private Health Insurance for Natural Therapies​ (the 'Natural Therapies Review') for 17 natural therapies. The reviews of the 17 therapies were conducted by the National Health and Medical Research Council (NHMRC) on behalf of the Department of Health, using a similar approach NHMRC had adopted for its Homeopathy review (which was incorporated into the Natural Therapies Review to 'avoid duplication of effort'). contrary to the experience of the millions of Australians that have safely and effectively used these therapies for decades and the growing body of good quality research demonstrating the benefits of these therapies. The NT Review was instigated in 2012 by the former Labor government, for the specific purpose of justifying the removal of Government support for the healthcare rebate for natural therapies, which Treasury projected would “save” $32 million annually. Therefore, from the outset, the aim of the NT Review was not to comprehensively assess evidence relating to the role and benefits of natural therapies in healthcare, but to justify budget cuts. "examined the evidence of clinical efficacy, cost effectiveness, safety and quality of natural therapies in scope of the Review". ​The NT Review did not deliver on its Terms of Reference (TOR) “to ensure that taxpayer funds that are paid through the Rebate to subsidise natural therapies that are underpinned by a credible evidence base that demonstrates their clinical efficacy, cost effectiveness and safety and quality”, since these parameters were all excluded from scope of the actual reviews carried out by the NHMRC, with the exception of 'efficacy'. 'Efficacy' only measures how well treatments work under highly artificial, controlled trial conditions - telling little to nothing about how well they work in the real world, for real patients with real health conditions. Under its remit, the Department of Health routinely performs Health Technology Assessment (HTA) processes, “to inform decisions about … reimbursement under Australian Government funding programs”. Yet inexplicably, core HTA parameters stipulated in the NT Review’s TOR were not assessed at all, despite being of central relevance to the NT Review’s stated purpose. Therefore, research consistently demonstrating the health and economic benefits to individuals and society when complementary medicine therapies are used as healthcare options was entirely ignored. It is unclear how a review of natural therapies aimed at informing the Government on the Private Health Insurance rebate is fit for purpose, when such essential parameters were not assessed (in particular real world 'effectiveness' and 'cost effectiveness' research). Creating extensive exclusion criteria that dismissed essential evidence from any consideration. A notable example of excluded relevant evidence were studies on herbal medicines - an extensive research evidence base that was entirely dismissed from scope, hence from consideration. Instead, the NHMRC reviewers narrowed the scope of the review to only including the ‘effect of herbal consultations’ (i.e. no research on herbal medicines was included). This resulted in no evidence being identified that met the selection criteria, rendering the exercise and its findings entirely meaningless. Unsurprisingly, the conclusion reached was: “the reviewers were not able to reach any conclusions as to [herbal medicine’s] effectiveness or potential harms”, while acknowledging “there is a large body of research on the effects of individual herbal agents and remedies”, which was ignored. The only plausible explanation for limiting the scope of the assessment so profoundly was budgetary and time constraints (i.e. it was too much work). This "finding" has been mistranslated into the inaccurate message that the Natural Therapies Review found ‘no clear evidence that herbal medicine works'. This is clearly an inaccurate conclusion based on speculation, and is not evidence-based (since no evidence was actually assessed). ​This methodological flaw applied to many of the other in-scope natural therapies. ​Similarly, in the case of Naturopathy, only systematic reviews that evaluated 'naturopathy as a health service' were included – resulting in only 1 abstract of an unpublished review on the effect of whole-practice naturopathy in chronic conditions being identified. No evidence relevant to the components of naturopathic practice (such as herbal medicines and massage) was included in scope. "It is also nonsensical to only include research evaluating the healthcare practice rather than the therapeutic interventions such as herbs, nutraceuticals, acupressure, lifestyle modifications etc that are used by the practitioners. Across the board, the majority of published medical research examines the safety, efficacy and cost effectiveness of specific interventions rather than the practitioner or health service. It would be interesting to apply the same limited methodology used in this report to other allied healthcare practitioners and medical specialists." Given the extensive exclusion criteria applied to the NT Review, it is perhaps surprising that the NHMRC reviewers did not review and incorporate the findings of other Government reports conducted in this area, to take advantage of work already done - but such reports were also excluded from scope. For example, a comprehensive review of herbal and naturopathic treatments commissioned by the Victorian government in 2005  in examining regulatory requirements for complementary medicine professions concluded that there was sufficient evidence demonstrating their benefits. ​Why such directly relevant, Government-commissioned research was not integrated into the NT Review process to avoid duplication of effort and fill in such large gaps in the data appears odd.